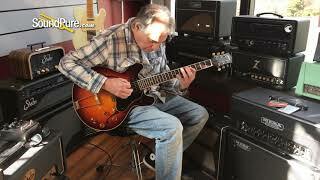 In this video, Sound Pure guitar specialist Eddie Berman demos a fully-hollow Collings I-30 LC Aged Faded Cherry Hollow Body #18136 through a couple of Surh Bella Head and Cab and a Boss D7 Delay pedal. 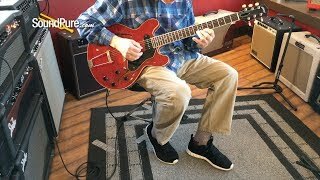 In this video, Sound Pure electric guitar specialist Eddie Berman plays a Collings I-30 LC Aged Tobacco SB Hollow Body Electric with a pre-owned Suhr Badger 18 Amp Head, Suhr Badger 1X12 Veteran 30 Cabinet, Strymon El Capistan dTape Delay Effect Pedal and Xact Tone Solutions Imperial Overdrive Guitar Pedal. Our goal for the I-30 LC was to take the concept of a double cutaway, fully-hollow, P90 equipped guitar and refine it to the extent that it offers something truly new for today's players. The result is one of the most acoustically responsive and versatile electric guitars we have ever offered. The lightweight, "trestle" braced body of the I-30 LC has been refined through extensive R&D and is the distillation of knowledge gleaned from our popular I-35 and Statesman LC series. The trestle brace design directly couples the neck and tail block, creating exceptional strength and acoustical energy transference, while also allowing for a lightness and responsiveness that is both a tactile and musical joy to experience. Playing the I-30 LC, you can easily feel the acoustic energy travel through the symmetric arches and re-curves of the top and back. These plates have been custom laminated and voiced for a tonality that is acoustic guitar-like in its resonance and dynamic response, but focused and feedback resistant enough to be utilized in jazz, blues, rock n' roll and many other styles. Our new custom designed trapeze tailpiece provides just the right amount of "give" for a relaxed string feel and effortless playability. Lollar Dog Ear P90s are perfectly matched to the instrument's acoustic response and offer a wide palette of tones from rich jazzy warmth to 1960's British Invasion style chime. Drawing its inspiration from both classic electric designs and our own previous models, the I-30 LC is an exciting step forward and an intriguing new Collings sound.